Few communities, even small ones, are culturally or socially monolithic. That is the case with Israeli Jews: There are only about 6 million Jews living in Israel, but there are major religious, social and political chasms that divide Jews within the borders of this small nation. Haredim are the most religiously devout group in Israel, with 96% saying religion is very important in their lives, compared with 30% of all Israeli Jews. The word “Haredi” literally translates to “trembling” or “fearing God,” and most Haredim live their lives secluded from the rest of society. They have few close friends outside their own group, and they generally oppose intermarriage with other Jewish subgroups. Haredim tend to dress more conservatively, often including large black kippas and shtreimel or fedora hats for men and wigs or other head coverings for women. Haredi men are much more likely to attend religious educational institutions (yeshivas), which also has traditionally exempted them from the mandatory military requirements that other Israeli citizens face – something that has been a recent topic of controversy in Israeli politics. Fully 83% of Haredim favor keeping these exemptions, but less than half of all other Jewish subgroups agree. Haredim are more ambivalent about the state of Israel than other Jews in some ways, because some have long felt there should not have been the establishment of a formal Jewish state before the arrival of the Messiah. For example, Haredim are far less likely than other Israeli Jews to identify as Zionists. Datiim are nearly as religiously devout as the Haredim. About nine-in-ten of those surveyed from both groups say they are absolutely certain in their belief in God, and nearly all surveyed from either group say they do not travel by car, train or bus on the Sabbath, in accordance with Jewish law. However, Datiim – sometimes described as modern Orthodox Jews – are much more integrated in modern Jewish society. For instance, Datiim are more likely than Haredim to say they value career success and world travel. And Dati men are much more likely to serve in the Israeli military than Haredi men. Dati citizens also tend to be active in Israeli politics. A majority among Datiim describe themselves as part of the political right, and fully 71% agree that Arabs should be expelled or transferred from Israel, significantly more than any other Jewish group. They also are more likely than those in the other three groups to say building Jewish settlements in the West Bank helps Israel’s security. Masortim are the most diverse of the four Jewish groups. They encompass a large middle ground between the two Orthodox groups and secular Jews. About half (51%) say religion is somewhat important in their lives, as opposed to very important (32%) or not too/not at all important (16%). While the three other Jewish groups often have strong opinions on one side or another on many issues relating to religion and public life, Masortim are generally much more divided. For example, while strong majorities of both Haredim and Datiim favor shutting down public transport during the Sabbath and over nine-in-ten Hilonim Jews oppose it, Masorti respondents are split on the issue (44% are in favor and 52% oppose). Masortim also are more likely to have Jewish friends from outside their group than the other three who, for the most part, socialize with members of their own community. According to surveys conducted over time, Masortim may be declining somewhat as a percentage of Israeli Jews. Hilonim, who tend to be secular in their outlook, are by far the largest Jewish group in Israel, making up roughly half of Israeli Jews. Only 18% are absolutely certain in their belief in God, and 40% do not believe in God at all. Hilonim strongly favor the separation of religion from public life in Israel. For example, they overwhelmingly oppose shutting down public transportation during the Sabbath. 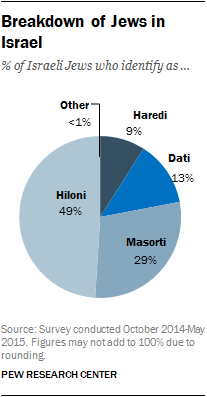 Hilonim are the only Jewish group in Israel among whom a majority (59%) say their Israeli identity comes before their Jewish identity. At the same time, overwhelming shares of Hilonim say they are proud to be Jewish and believe a Jewish state is necessary for the survival of the Jewish people. Large majorities of Hilonim say they partake in Jewish rituals, but these include events that could be seen as cultural rather than religious, such as lighting Hanukkah candles or attending a Passover Seder. These views reflect the fact that 83% of Hilonim see being Jewish as a matter of ancestry and culture rather than as a matter of religion. Hilonim also overwhelmingly say all or most of their close friends are like them (secular), and they are also especially likely to marry within their own group.